Solid fuel or biomass boilers offer an environmentally friendly way to generate heat for your home and reduce household bills. Biomass products such as wood pellets and agricultural crops are carbon neutral, releasing the same amount of carbon dioxide as they take in through natural processes. They are also more cost effective and efficient than natural fuels such as oil, coal and gas. Save and earn. As well as cutting your household bills by burning renewable products for heat, you can also make an earning with the Renewable Heat Incentive. This scheme pays out 9p/kWh for every unit of renewable heat generated. Benefitting the local economy. By utilising biomass products you’ll be helping the rural economy and giving local business the opportunity to provide UK sourced fuels. Improving your home’s carbon footprint. As a carbon neutral fuel source, burning biomass products is much better for the environment than oil, coal and gas. Biomass is known as carbon neutral as the only emissions released have been captured through natural processes. Suitable for off-Grid areas. Many parts of the UK aren’t hooked up to the National Grid, meaning more expensive fuel such as oil is used. With biomass you can slash your bills further. High efficiency. Biomass boilers operate efficiently, converting more fuel into heat. Inefficient, older boilers can be working at just 70%, whilst biomass boilers will be as much as 94% efficient. 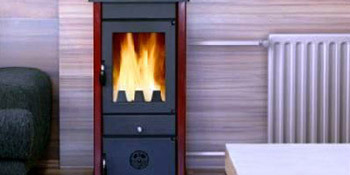 There are a number of major incentives for installing a biomass boiler for your home. You’ll see an instant saving on your heating bills, earn a fixed income with the RHI and be cutting carbon emissions at the same time. For up to four FREE quotes for a biomass boiler, simply complete our quick form. We’ll then provide you with quotes from local, vetted and reputable installation companies, to you can compare prices and ensure to get the best deal. How much will I save - Solid fuel boiler. Project: Replace old combi boiler. The below information displays the energy performance of homes in Uk. Energy ratings vary from A to G, with A being the most energy-efficient and G being the least efficient. The Energy Performance Certificate (EPC) rating factors heavily when you want to sell your home, as possible buyers will see just how much they're likely to be spending on their heating expenses. Home improvements including insulation assist to drastically increase a home's EPC rating. There are many types of property in the UK and the information beneath illustrates the type of housing within Uk. Over the country the most popular housing types tend to be semi-detached and terraced housing, yet detached homes, flats and bungalows are also available. The data underneath gives an indication to the number of households in Uk which are central heated and non-central heated. Households are heated by a range of sources which indicate how expensive annual energy bills are going to be. Examples of central heating include gas, electricity, oil, solid fuel and LPG boilers. Changing exactly how your property is heated can see you with cheaper bills. The information underneath reveals the spread of houses heated up by various fuels. Around the United Kingdom the most common by far and away are gas heated houses, followed by electricity and then oil. Biomass boilers are also growing in popularity, heated by green products including wooden pellets or agricultural waste.|Houses in the UK are warmed by a range of fuels, such as gas, electricity, oil, solid fuel and LPG boilers. Each fuel has a varying cost associated with it so you may find yourself with more affordable energy bills by changing the way your home is heated. Even solar thermal panels are being regarded as by many as a way to lower heating bills for the many years to come.